Ampelopsis brevipedunculata fruit.Les Mehrhoff.www.discoverlife.org (Accessed 4/2014). Ampelopsis brevipedunculata is a woody vine 10-20 m long, tendrils opposite leaves, new growth hairy, older bark tan, flaky (not shredding). Aggressively colonial. Leaves alternate, stalk long, finely hairy, blade 6-12 cm long (Brand 2001), to 9 cm wide (Radford et al. 1968), wide, shallowly three-lobed, to deeply five-lobed, lobe tips pointed, base round-lobed (cordate), surface hairy, green on both sides, margin toothed, much like grape leaves. Flowers green, sexes separate on the same plant (monoecious), very small, radially symmetrical, 5-parted, petals free, calyx inconspicuous, saucer-shaped; ovary superior but often imbedded in the surrounding disk that produces nectar; blooms July-Aug.; insect pollinated (Fern 2004). 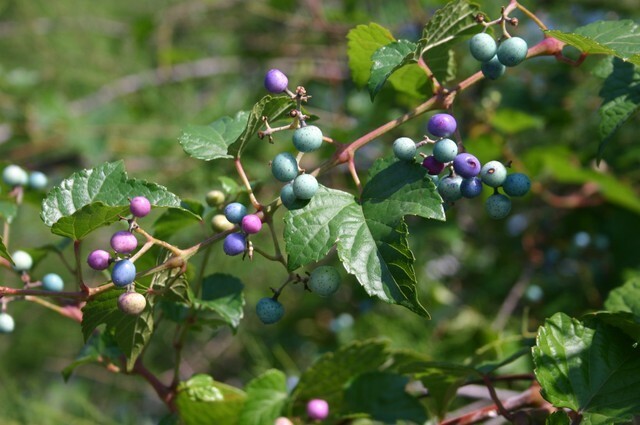 Fruit hard-fleshy, pinkish then bright blue or mottled with white, 0.6-0.8 cm wide, seeds 2-4; bird dispersed, also eaten by raccoons (Wilson 1993). Ampelopsis brevipeduculata. Steve Manning.wiki.bugwood.org. http://www.extension.org. (Accessed 4/2014). Habitat: Common and very aggressive along highways, second growth, edges, forest and woodland gaps. Notes: Shades out, weighs down and breaks trees, especially in winter ice and snowstorms. Retards succession of native forest. Often intermixed with Oriental bittersweet and Japanese honeysuckle. 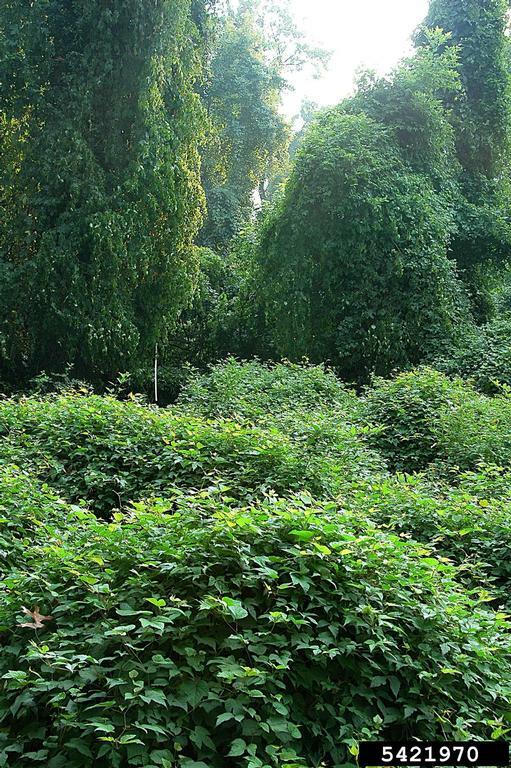 Intolerant of deep shade, does not invade closed canopy forests (Robertson et al. 1994). Outcompetes native plants for water and nutrients (Young 1996). Listed as invasive in the northeast by every state from New York and Massachusetts to Virginia and West Virginia (Swearingen, J. 2007).